Territorial expansion since 1803, by William R.
This is a list of historic regions of the United States , defined as regions that were legal entities in the past. 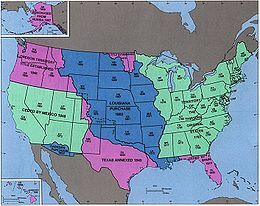 The following are land grants, cessions, purchases, defined districts (official or otherwise) or named settlements made within an area that was already part of the original 13 colonies or a state of the Union or U.S. territory, including major land acquisitions (of varying degrees of legality) from Native Americans that did not involve international treaties or state cessions. Territory of Indiana (1800–1816) split into the Illinois Territory, Michigan Territory, and the state of Indiana . State of Deseret, unofficially declared independence in 1857 in the Utah War between Mormon settlers and the U.S. government. Comancheria, the Oklahoma Panhandle during the late 1800s. Dinétah, named for the Navajo Indian Reservation. Lenapehoking, named for the Delaware or Lenilenape Indians. Oklahoma as a separate Native American country, especially the Cherokee Nation and four of the Five Civilized Tribes. Aztlan, the mythical land of the Aztecs located in the Southwestern U.S. in Mexican-American political activism.